The Yellow-collared Macaw, unlike other parrot species, seems to tolerate extensive habitat change and remains common in some areas. 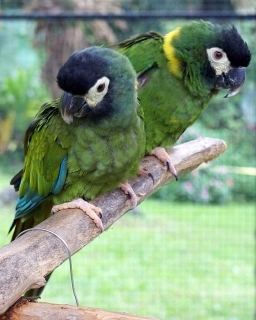 Both adults mostly green plumage; brown/black forehead, crown and lower cheeks; yellow collar around hindneck; tail blue with brown/red towards base. Bill grey/black with horn coloured tip; white/cream bare face. Eye orange. As in adults but with grey/white bill and grey eyes. Calls in flight loud and gull-like. Also emits notes resembling those of Aratinga sp. conures. Psittacine Aviculture, Schubot, Clubb and Clubb, 1988. Common and frequently bred in the US; less so elsewhere. Aviary or suspended cage minimum length 4m (13.1 ft) or 3m (9.8 ft) for breeding with access to larger flight for part of year. Dried figs soaked in water a few hours, two or more per bird daily, with one drop of Konakion (Roche) or other vitamin K additive, once daily; fruits forming at least 50 percent of diet; soaked sultanas; berries (elder, mountain ash, pyracantha); spray millet; small seed mix with: canary, oats, safflower; cooked pulses; rearing food with: hard-boiled egg, wholegrain bread and carrot, all ground to crumbly consistency; for breeding: live food (mealworms) if taken; commercial insectivorous food; variety of vegetables; walnuts; complete pellet. Loves bathing, socialization; needs large, roomy cage; different sized perches; fir, pine, willow or elder chewable branches; ropes, swings, ladders, puzzle toys, bird-safe chewable toys (vegetable tanned leather and wood blocks). Scarcer at edge of range in Paraguay. Generally common even in areas of habitat disturbance. Found in N and E Bolivia to SW Mato Grosso, Brazil, and N Paraguay to NW Argentina; also Ilha do Bananal in W Goias, NE Mato Grosso and deep SE Para. Occurs in variety of habitats such as forest, forest edge, woodland and savanna; moist upper tropical and subtropical forest in Argentina, dry forest in Bolivia, chaco in Paraguay and pantanal, open cerrado and gallery forest in Brazil. Up to 600m (1968 ft), in some areas 1700m (5576 ft). Eats fruits, flowers, maize and seeds. Seen in pairs or small groups (outside breeding season). Large flocks where food abundant, and at roosts. Occasionally feeds on the ground.